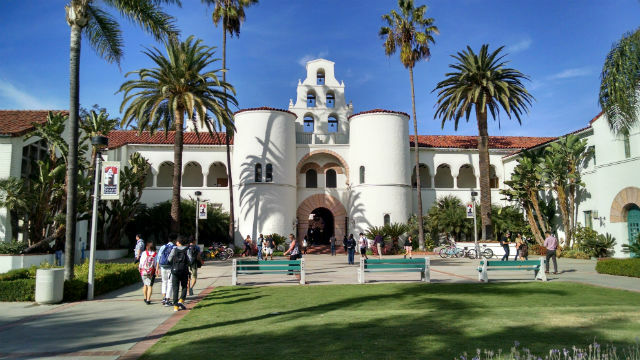 Two San Diego State University police officers acted “completely appropriately” when they took down and arrested a man near the school’s Open Air Theater last month, a prosecutor said Wednesday. Marquis Dejon Campbell, 20, faces five counts, including misdemeanor resisting arrest and being under the influence of methamphetamine. Deputy District Attorney Oscar Hagstrom told a jury that Campbell — who was not a student at San Diego State — made a series of bad decisions the afternoon of Sept. 15. The prosecutor said Campbell was under the influence of meth when he went into the area around SDSU’s Open Air Theater and ran away from a security guard who tried to question him. After police were called, Campbell refused to cooperate with officers who asked him more than 10 times to sit down near a Starbucks, Hagstrom said. When Campbell tried to walk away, the officers grabbed him and — in an incident recorded by a student’s cell phone — took him down to the ground. Campbell is heard screaming and claiming the officers were breaking his arm, the prosecutor told the jury. A blood test administered after Campbell’s arrest confirmed he was under the influence of meth, Hagstrom said. Campbell’s defense team told the jury that although their client had meth in his system, he was not under the influence at the time of the incident. The defense asked the jury to determine if Campbell’s arrest was justified and whether the officers’ use of force was justified. They said Campbell was not guilty of the charges against him.